Featuring eco-friendly, noiseless rotation and small footprint, the Kliux Geo 1800 wind turbine is the first vertical-axis turbine that combines the lift-type Darrieus rotor and the drag-type Savonius rotor into one single rotor of eight blades made of expanded polyurethane developed by Kliux Energies business partner, Bayer MaterialScience. Each unit can capture wind speeds less than eight miles per hour. The unit on display at the 2013 WindPower Expo will be powered by electricity to simulate wind rotation and breakless, self-regulating system. 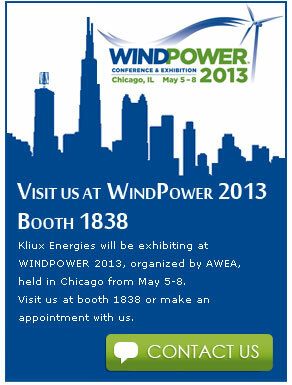 Many of the Kliux Energies core executive team will be at the 2013 WindPower Expo to demo the breakthrough Kliux Geo 1800 technology.